AudioStretch may be the only slow-downer app that does video. 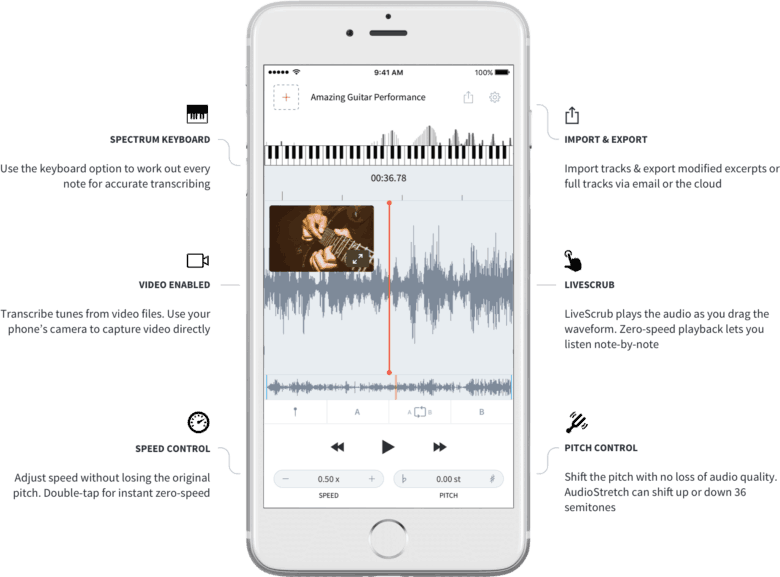 AudioStretch is a “music transcription tool.” It’s a universal iOS app that slows down music, and/or changes its pitch, so you can learn to play songs. We’ve covered another of these, Capo Touch, before on Cult of Mac, but AudioStretch is easier to use. 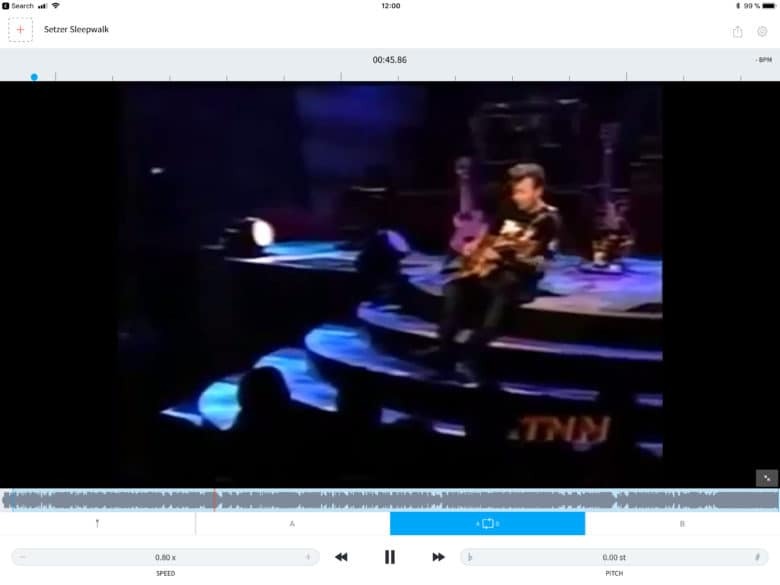 Plus, a recent update added the ability for the music transcription app to work its magic on video. The very best way to learn to play a song is to transcribe it. This forces you to listen, and to work out not only the notes in the song, but how and where to play them. On a stringed instrument like a guitar, this is extra-tricky, because you can play the same notes and chords in many different places on the neck. It’s easier to go to YouTube and watch a tutorial video, but if you transcribe a song yourself you’ll learn so much more about not only the track itself, but about how your instrument works. Today, we have some great music transcription tools. AudioStretch is a fine example. It lets you play back a song at any speed, without altering the pitch. You can also change the pitch without changing the speed, or you can change both together, which is useful for learning all those Jimi Hendrix songs where he tuned down half a step. Everything is in easy reach. 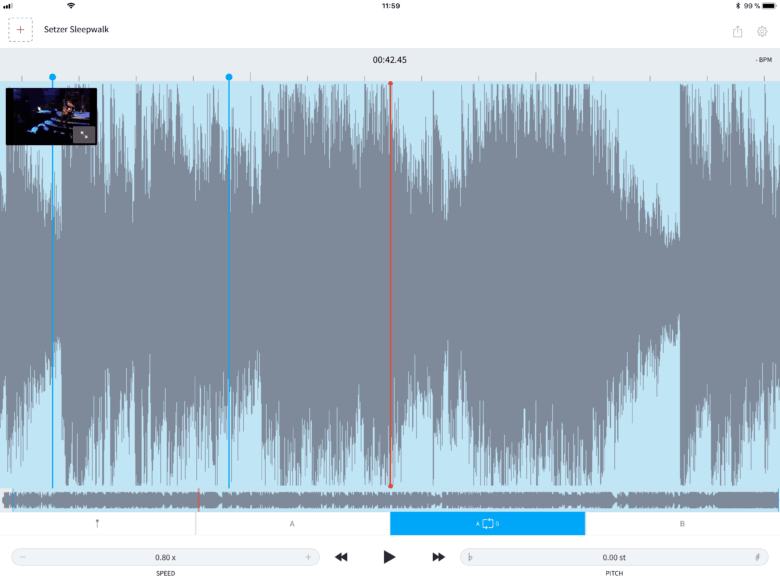 Like most examples of this kind of app, AudioStretch also shows the music track as a waveform, which makes it easier to grab the track and scrub it back and forth. If you scrub and then stop with your finger still held on the screen, the current note will be sustained, so you can identify notes in short passing phrases one at a time. You can also set up a loop, to repeat a phrase over an over, as slow as you like, until you can get it worked out. But maybe the neatest feature is that AudioStretch can do all this with video, too. You need to have the file stored somewhere locally on your iPhone or iPad (here’s how to save videos from YouTube), but once that’s done, you can load it into AudioStretch and scrub it, loop it, slow it down, and everything else. This is a fantastic way to learn a piece, especially if you can find good live footage of the artist playing it. All the audio tools work for video too. In video view, you can choose to have the video as a thumbnail in the corner or show up full-screen. Well, almost full-screen — the controls are still visible and handy. AudioStretch, from developer Cognosonic, has become my favorite slow-downer because it is so easy to use. Unlike Capo Touch, which gets more complex and fiddlier to control with every update, AudioStretch is simple. Just tap anywhere on the waveform (not just on the play/pause button) to stop and start playback. All the other functions are right there on the main screen, so you don’t have to dive into pop-up menus like you do in Capo. You can add bookmarks, create A-B loops, and tweak pitch and speed, all from a single, simple control panel. This leaves you to focus on learning the song, not on manipulating the app. The app does lack a few essentials, though. For example, you can only have one loop-region at a time. To be fair, Capo only just managed to make multiple loop regions work intuitively in a recent update, but sometimes it’s handy to be able to mark several loops throughout the song, and be able to step between them. AudioStretch also lacks any external keyboard controls. But at $10 for the full version, this might be the best thing you can buy if you’re ready to start transcribing songs yourself, or even if you just want a great way to slow down those YouTube tutorials.